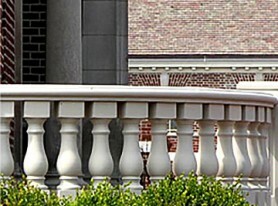 We have been manufacturing exterior composite balustrade systems for over 20 years. Our balustrades, manufactured using a rotational cast method, are made from a resinous marble matrix that is reinforced with fiberglass strand. 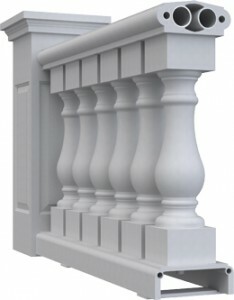 Our casting method results in a reinforced hollow construction that will last a lifetime but will not cost an arm and a leg: In addition to the savings in materials and installation, you will significantly save by not needing to reinforce your structure to support the added weight of natural stone, cast stone, or concrete alternatives. Our systems weigh from 15 to 100 lbs per lineal foot depending on the configuration so they are very robust but, when compared to stone and concrete which are warrantied for no more than a few years, we are half to a third of the weight. 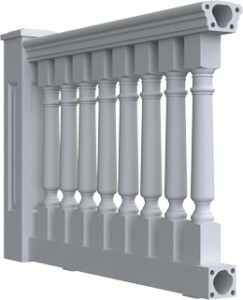 Definition: A balustrade is a system comprised of balusters or spindles that are capped by a top rail and more often than not supported by a bottom rail. 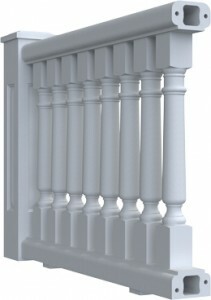 The rails and spindles are then either secured between newel posts, architectural columns, walls, brick piers, or any structural member that can hold the rail sections safely in place. The system also includes any support blocks or drainage spacers, post caps, decorative finials or lighting accessories, and the relevant hardware to install everything. 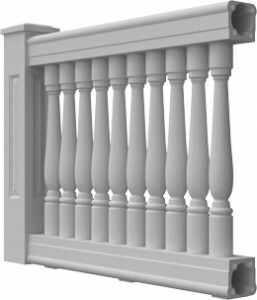 We offer an assortment of standard balusters ranging from 1” pickets to 10” wide belly spindles. 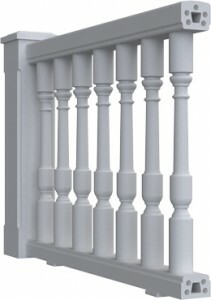 Our railings range from 4” to 10” wide with our 7-1/2” medium system being the most popular. 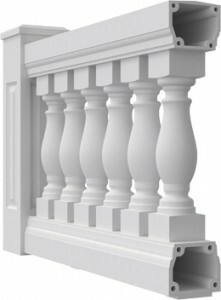 Most of our combinations are made to work with recessed panel posts that have a panel on all 4 sides. We also offer posts with routed edges or plain panels ranging from 7” to 26” wide and from 30” to 50” tall. We offer matching panels spanning up to 8’ long that can be used to create large custom posts or planters. Our caps are offered in a standard routed edge style or in a decorative tiered level style with peaked or flat tops. Our systems can be accented with an assortment of finials, including: urns, artichokes, or balls.